New "My Little Chloe" Adrable limited edition : Happy Aging & Beautiful Anti Aging loving. It is still cold , but I can feel the signs of spring will come from the sky . 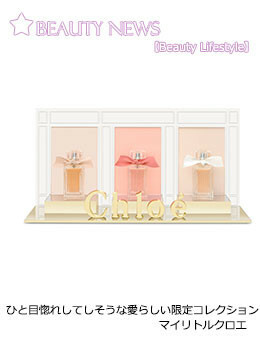 From "My Little Chloe", it appeared new of fragrance fourth. Each year, limited fragrance that sold out very popular, Rose fragrance is Chloe symbol. Fresh and soft and delicate fragrance of "Chloe eau de toilette". To explore deep into the essence of the White Rose, a unique floral aroma.